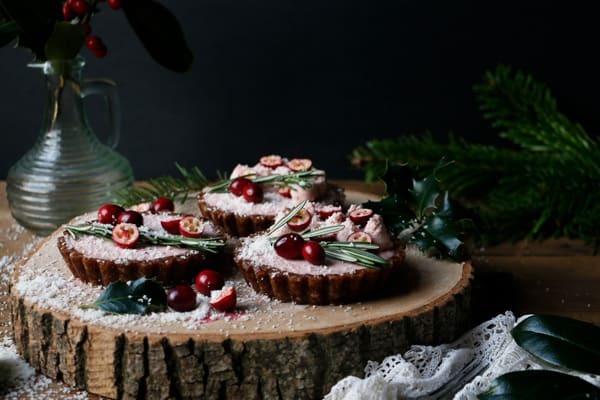 My last Christmas recipe! 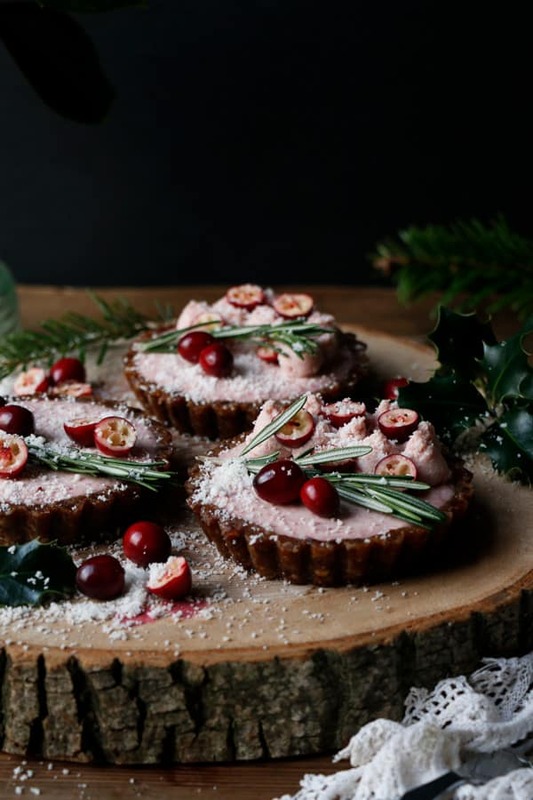 As promised I have a raw version of my Gingerbread Christmas Mini Cakes for you today – Raw Gingerbread Cranberry Christmas Tarts, just fitting these in the last minute. 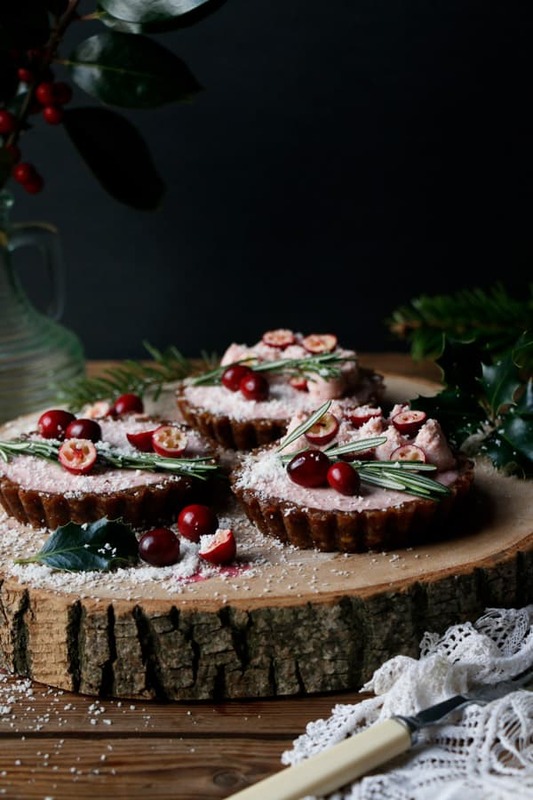 They are the yummiest raw tarts completely inspired by Christmas that I hope you will love. I really went overboard in making these and used lots of wonderful ingredients to make them really special. For the crust I’ve used a mix of almonds and walnuts with medjool dates, figs and muscatel raisins with orange zest and lovely gingerbread spices. And for the filling I’ve opted for macadamia nuts with fresh cranberries, coconut butter and orange juice. Once all of these ingredients have some time together they truly shine. Wishing you the most wonderful Christmas filled with LOVE & LIGHT. Place almonds and walnuts into food processor and pulse few times until they are coarsely ground. Add pitted dates, figs, raisins, orange zest, ginger, cinnamon, cloves and salt and blend until the mixture starts coming together when pressed. Add maple syrup if needed and blend until the mixture sticks together. Spoon the mix evenly into the six tart tins. Press tightly onto the base and the sides to form a crust. Place into a fridge. In a double boiler gently melt coconut butter and set aside. Rinse the soaked macadamias under running water and place into high speed blender. Add cranberries, orange zest, cinnamon, salt, maple syrup, orange juice, lemon juice, vanilla and water and blend until smooth. If necessary add little more water or maple syrup. Slowly add melted coconut butter and blend until incorporated. It should be fairly thick creamy consistency. Pour or spoon evenly onto the crust layer of each tart and smooth out the top. Place into a freezer to set. You can also set them in fridge overnight, but it's easier to remove them out of tin when frozen. Once set carefully remove from the tins and leave to thaw before decorating. Top with fresh cranberries and rosemary sprigs. To make the snow effect, blend some flaked coconut in a blender until desired consistency. 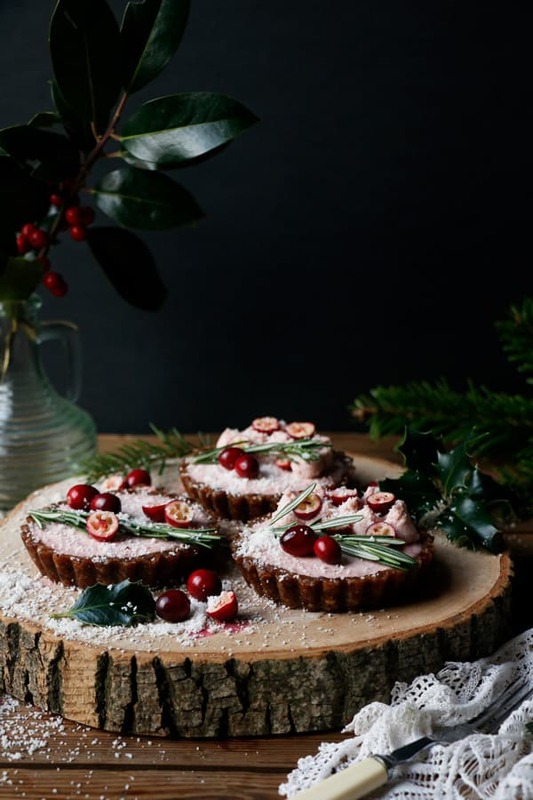 Sprinkle on top and around the decorated tarts. Store in a fridge or freezer. I've used 6 small 10cm tart tins with removable base in this recipe. You can line the tins with some cling film if you prefer, but I don't tend to do that, because once they are frozen you can easily push them out of the tins if the base is removable. 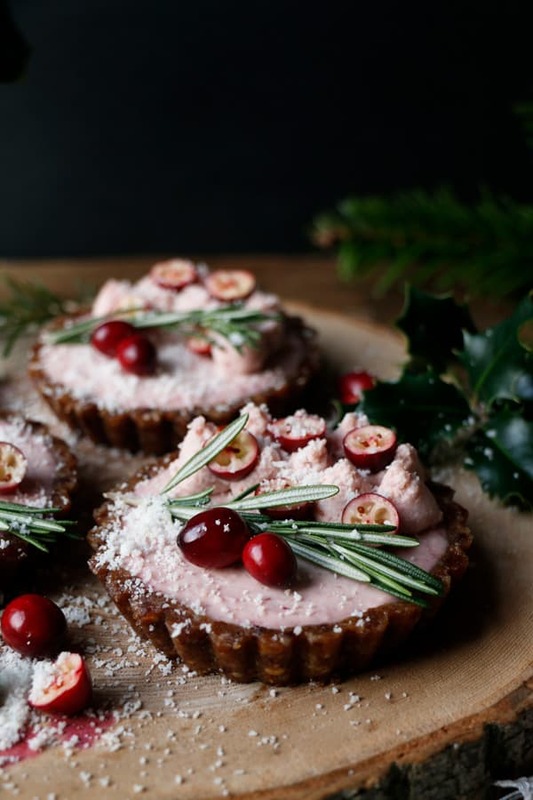 If you have some filling left over, pop it into the fridge and you can pipe some on top when you're decorating the tarts. You can replace the macadamias with cashews if you prefer or a mix of the two. Hello and warm welcome to Nirvana Cakery! 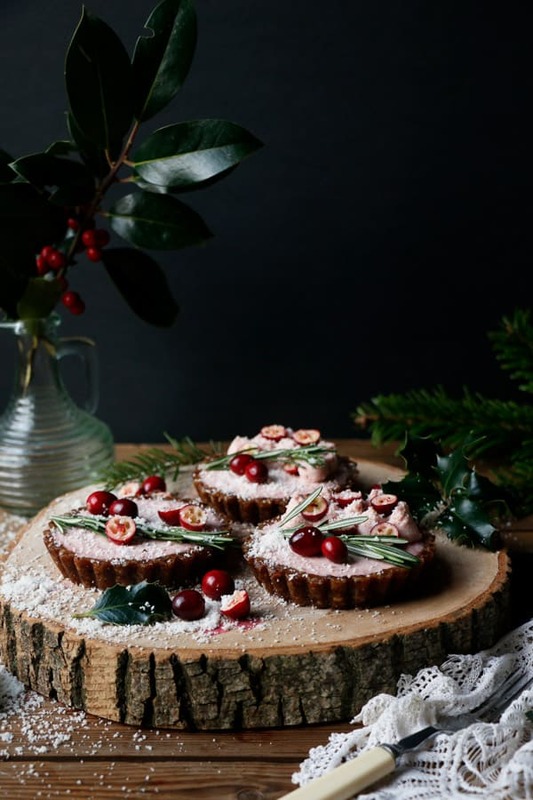 I'm Hana, mum, foodie and a food blogger sharing wholesome seasonal plant-based & gluten-free recipes. Read more.